It is the eyes, not the teeth that impress you. The sound that can never be capture don photograph or video, and the adrenaline that can not be conveyed by any medium except putting on the suit and mask and taking the plunge yourself. 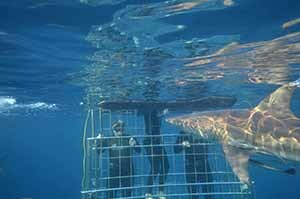 Our fascination with the much misunderstood shark means that tourist shark diving has become an industry in itself. “Swim towards the guys that smell like deoderant and stress and you’ll get food,” said the captain, John Miller. He was joking, I think. Part of a world-wide plot to classically condition sharks to eat travel writers? 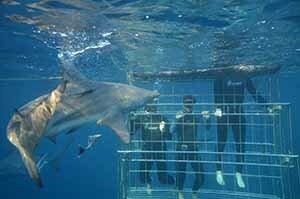 Shark cage diving is a growing and thriving industry, tourists cannot get enough of it in the new age of experiential tourism. 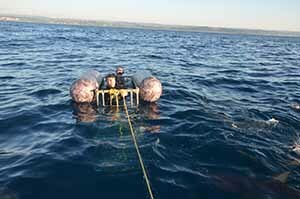 It works the same way all around the world: the boat owners put a big cage on board the boat and head out to sea; eight kilometers in this case, and then drop the cage in the water. They put people inside the cage, so the animals can come and look, a bit like the monkey cages in the zoo except in reverse. 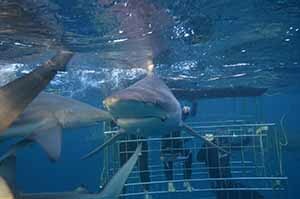 They then charge the sharks twelve euro to come and look at the humans. Or so it should be. Instead they chum the sharks with fish oil, liquid anchovy oil to bring them near to the boat. 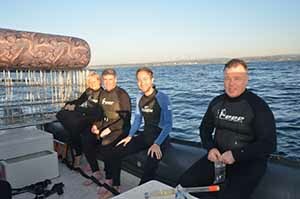 They then feed them bits of chopped up fish so that they stay around while each of the divers gets in the water. It is a bit like those safari people who feed lions to bring them close to the vehicle. A definite no no. The boat skippers say that fishermen have been doing it for generations but really that is not a defence. The people from Fair Trade in Tourism South Africa (FTTSA) say they have finally certified one shark dive for good practice, something which surprised me as the entire concept is problematic. Our shark diving guide at Park Rynie near Durban chummed and fed merrily. Our host John Miller and the deck hands Muzi Zikhali and Lindani Mathjwa are not doing anything different from everyone else on the other corner of the country around Cape Town. 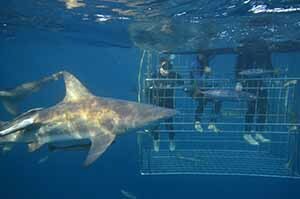 The upshot is that when they put me and two of my travel writing colleagues into a cage and the sharks came and swirled around us. Okay, the ethical considerations are not what comes to mind when you are down there. First the sound, the bubble of your air and the dull boom of the underwater ocean, then the clink, chink of the cage. Then the animals themselves, they look like Mo from the Simpsons except with more teeth showing twenty odd shiny pearlies on the lower jaw all exposed at once. But the feature that strikes you most is their eyes, round and glassy. Most of the western cape dive experiences the ones out of Gansbaai and Kleinbaai, are Great White Shark encounters, much more glamorous and Charlie Boorman. Our encounter was with tiger sharks. There was a menageries around them, little ones eating parasites off their backs, big round ones, repeating a cyclical and frenzied tennis-match over and back maneuver. We had a good look, then a research vessel came by noisily and the sharks all left. So the skipper moved the boat. We went down for a second look, fewer sharks but again that amazing sound and amazing view of the animals. Then an embarrassment. Motion sickness. 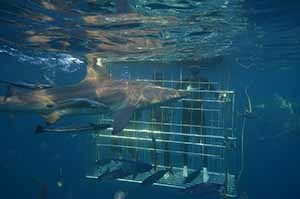 In a shark cage. I felt queasy every time I returned to the surface. I went down underwater again hoping that it would go away. My stomach was now filled with salt water as well as everything else. I had worked on my laptop on the drive to rocky bay beach. This has my stomach a little upset before we even put to sea. The oysters starter, two types, and the vindeloo curry from the night before also has my stomach upset. Maybe the nervousness of being so close the shark has also played its part. The heavy weighted diving belt, tight on my middle-age spreaded midriff, played its part too. The great question of the moment in those extremely shark infested waters was: do I get sick over one of my fellow writers in the shark cage and have the ignominy of this mishap forever ringing through print, airwaves and web. I surface and go back to the boat. There are few feelings of uncertainty like the nausea that suggests the food supply of the previous 24 hours is all about to come up the way it went down. Another colleague is now getting sick over the edge. I didn’t barf, but it was close. Feeding the sharks never had a clearer meaning. These dives are good to demystify the shark, maligned for being more aggressive than actuality. You can’t overdo the rehabilitation of the much-misunderstood beautiful animals, and chumming might be a small price to pay. You got to recognize some of them, with their scars, mementoes of past battles, what a life story they could tell. As well as eating the bait thrown overboard I saw one swallowing a live fish. Life snuffed out in a bite. To quote Monty Python’s Meaning of Life, makes you think. another of the coolest things I am going to do all year before lunch that day. A cross between zip lining and bungee jumping is the bungee swing. You jump from a height of 108 metres over the green grass, bounce on the rope and swing out into the middle of the new soccer stadium in Durban. Comfort zone is not even in the same galaxy as this experience. I am not afraid of heights but standing on the platform I was terrified. It took them three goes to get me the edge, I then jumped like a coward, screaming and clutching the rope, persuading myself it was more a zip line than a bungee. The drop was sudden and nit too long before I was left floating in the air, arms outstretched like an angel. It was peaceful, exhilarating and most importantly, over. Coming back was painful. They hoisted me up, bobbing like an orange in a bath-tub, and I spun outrageously backwards and crashed into the viewing platform. But I was so filled with adrenaline and fear I did not mind. really appreciate it. The time bobbing around over ground is like an eternity. A great experience? Perhaps. Glad that it was over. Definitely.